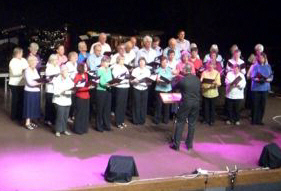 The chorus was formed as the "North Riding Chorus" in 1968, under the direction of Barry Griffiths who was at the time Music Adviser for the North Riding of Yorkshire Education Committee. The first concert was performed in 1969, and the Chorus then quickly established a fine reputation for singing principally large-scale and sometimes rarely-performed works. We have always aimed to reach a wide audience by performing in venues scattered throughout the county. When the Ridings were disbanded and the county became North Yorkshire, the Chorus changed its name too. Some regular venues which used to be in the North Riding now became in Cleveland; and concerts have also been given in venues in south Durham. 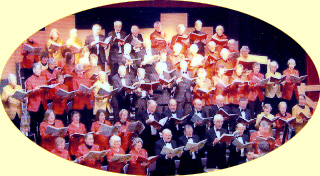 Membership fluctuates from 80–100, and singers come from all around this large county: from Malton to Yarm, Guisborough to Leyburn, Boroughbridge to Richmond. Because of these long distances to travel, rehearsals cannot be on a weekday evening but have always been fortnightly on Saturday afternoon. 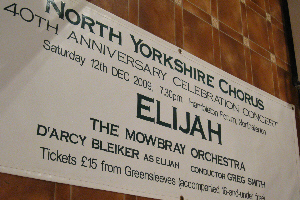 At least two concerts a year are given at various venues, which have included Ampleforth Abbey Church, Ripon Cathedral, Selby Abbey, Middlesbrough Town Hall, Harewood House, and the Dolphin Centre in Darlington; also halls and churches in the market towns of Northallerton, Thirsk, Saltburn, Guisborough and Richmond. Most recently we have concentrated on giving concerts in Northallerton and Thirsk. We pride ourselves on reliability: a performance of Messiah in December 2010 went ahead despite severe winter weather. Our repertoire, which includes most of the larger choral works from Handel and Mozart to Vaughan Williams and Michael Tippett, is usually performed with professional orchestras and soloists of a high calibre. A complete list of the main works which we have performed is on the page. Occasionally we do something a bit different: an example was our "Evening of Operatic Favourites" in 2012. From time to time other events, such as training courses, are arranged. The most recent of these was the "Choral Ambition" day on 18 September 2010. The chorus has made 5 trips abroad. The first tour was to Finland in 1987 to sing the Verdi Requiem in Joennsu and Kuopio. The second, to Germany to perform the Mozart Requiem in Erfurt, Gotha and Heiligenstadt, was arranged before, but happened after, the Berlin Wall came down in 1991. East Germany was in the first stages of reunification and we witnessed the retreat of the Russian troops by train from Erfurt. The next visit in 1995 was to Columbia in South Carolina, USA, for another performance of the Verdi Requiem . The fourth memorable visit was to Hong Kong to mark the millennium year. This was arranged with the Hong Kong Bach Choir to celebrate the centenary of Elgar's wonderful piece, The Dream of Gerontius, in Hong Kong. Martin Hindmarsh and his wife Jennifer Westwood were soloists in the production in Hong Kong Cultural Centre's main concert hall, which was conducted by Jerome Hoberman. Most recently, in May 2008 the Chorus visited Ormesson-sur-Marne near Paris, the twin town of Northallerton, the county town of North Yorkshire. 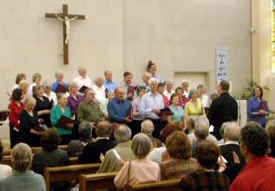 A concert of short items was given in the parish church; and a contribution was made to a gala concert featuring a variety of singing and instrumental groups and held in the town's Cultural Centre. The Chorus celebrated its 30th anniversary in 1999 in a concert with the Grimethorpe Colliery RJB Band in Ripon Cathedral. With the aid of a grant from Yorkshire Arts, the Chorus commissioned the composer Philip Wilby to write a work, The Lord is King, for chorus and brass band which was premièred at the concert; and there were also pieces by Martin Hindmarsh (Psalm 150, written for the Chorus on a previous occasion and now re-arranged for brass band accompaniment), Kodaly and Verdi. The band also played several items, thrilling a packed audience in the Cathedral. For the 40th anniversary in 2009, Mendelssohn’s Elijah was chosen, marking also the bicentenary of the composer’s birth. This was given in the Hambleton Forum, with a stunning performance by the North Yorkshire-born bass-baritone D’Arcy Bleiker as Elijah.